ARE YOU TIRED of the outpouring of HATRED, BULLYING, and CONTENTION coming out of an increasingly polarized world? This case study of antisemitism will lead you to new insight on how HATRED gets its foot in the door. Often known as THE OLDEST HATRED, ANTISEMITISM has punctuated Jewish history since biblical days. It has not evolved in a vacuum, but like all forms of HATRED has adopted ideologies that seem to lead nowhere but to a DESTRUCTIVE FUTURE. 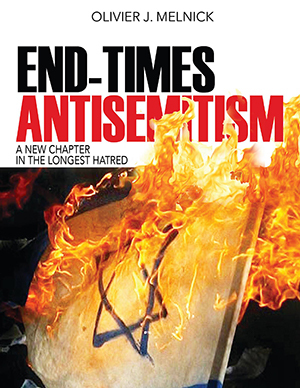 Author Olivier J. Melnick believes that END-TIMES ANTISEMITISM, a rapid increase in frequency and severity of hatred towards JEWISH PEOPLE and the nation of ISRAEL, is predicted in the Bible and paves the way for the greatly anticipated Second Coming of the Messiah. • HOW DOES END-TIMES ANTISEMITISM DIFFER? This NEW HATRED is cloaked in a garment of social justice and tolerance that to this day generates a constant stream of irrational thinking. It has been hip to be politically correct, but also short-sighted. Continuing to sidestep historical facts and cast rational thought aside creates CHAOS, not peace partners. • WHY IS IT DANGEROUS? Previous forms of anti-Semitism were obviously costly, taking millions of lives, imposing restrictions to Jewish people on religious practice, travel, economic development, and other precious freedoms, and significantly preventing them from protecting themselves. Does this sound familiar? The cost of ignoring HATREDunleashed towards the people and nation of Israel is its satanic spread against Western Civilization and the freedoms we all cherish. • WHAT CAN PEOPLE OF GOOD WILL DO? More than an exposé, this book offers to equip the reader with the Judeo-Christian principles necessary to fight this latest evil battle to wipe out ISRAEL and the Jewish people and to defeat free societies who have been their friends.